So what would you do if you came home from a long day’s work and your house is filled with teenagers exuberant that their last exam was over, all them ravenous because they had been playing hard for last six hours in the hot Tennessee sun, and the last thing you’ve thought about all day is what you would have for dinner? Well, the first thing you do is sigh with relief that this group of great kids doesn’t even notice that the floors haven’t been mopped in a while and that there were dishes that hadn’t been washed and at least 3 days of unwashed laundry piled up. Then you say, “Yes, I’d be ever so happy for you to use my brand new Le Creuset braiser to cook enough food to feed the hungry horde – as long as you cook.” (this braiser is teenager-proof). Then I just sit back with my laptop, pretend to be distracted typing, and soak in the sounds of youthful exuberance. And while these 17-19 year olds innocently perceive me as the quiet, nerdy mom who plugs away on the computer writing my latest international espionage bodice-ripping plant mystery historical novel, they have no idea of the crazy fun time I had last week-end on my Fling. So let me introduce you to a few of MY garden blogger friends from last week and give you chance to check out the their blogs. Cause I really only have a few minutes before I need to go start pulling out dessert. Robin and I really can’t tell who that is under that big hat but I’m sure we ended up best of friends. MaryAnn (Gardens of the Wild Wild West) – a lady who stands out in the garden world. Our bus driver. He may look like an Appalachian moonshiner but he knew more fun facts about this neck of the woods than anyone we heard. And this is not Nan Chase (Eat Your Yard), but it is in her garden – which was, by the way, an inspiration. 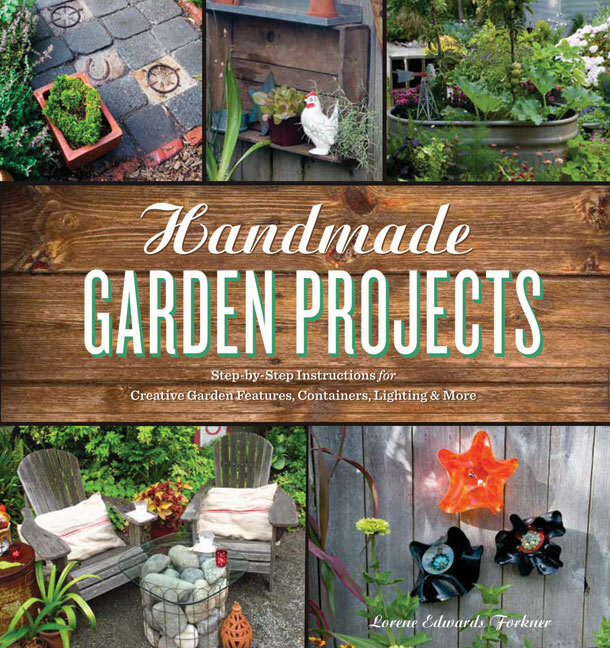 This past summer I had the privilege of meeting the delightful author of ‘Handmade Garden Projects’ – Lorene Edwards Forkner – and was able to see her gardens first-hand, including many of the projects in her book. What impressed me about Lorene was her genuine passion for creativity and an almost a child-like enjoyment of what I grew-up calling “crafts”. Lorene makes re-purposing an attainable and practical goal for your garden. “If I could offer anyone advice about taking on their own garden projects – whether one of the ones found in the book or something of their own creation – It’s to get back in touch with their childhood sense of play and interacting with the outdoor environment. Experiment, test limits, and even fail a bit. The magical part is always in the process and sometimes we end up with something way better than anything we set out to create. I would say the outdoor terrarium project was an example of that for me. So much has been written about indoor terrariums but we all know what happens to plants under glass in the sun! I was totally experimenting with an object I had around the house (the large light fixture) and pushing the limits. The resulting completely enclosed, self-sustaining composition of plants has been a delight. What a treat it’s been to have this SHADY nook and garden feature in the garden that looks lush and detailed yet asks absolutely nothing of me on a regular basis. Now in its third summer, I’ve had to change out the annuals but the perennials have held up fine through a couple of challenging winters. The other advice I might pass along is when something doesn’t work – MOVE ON! Trust me – there were plenty of projects I thought would be brilliant that were… well, let’s just say they were NOT brilliant! My basement – always a repository for stray bits and collectibles is also where all my not-yet-finessed ideas languish! The projects that did NOT make the book live there. This outdoor terrarium made from an old giant light has been growing for almost 3 years. These last twelve months have held monumental moments- #2 son marries his high school sweetheart, #3 son graduates from high school, #1 son and his wife bring a new granddaughter into the world, #4 son takes the acting world by storm with his scene-stealing lines as Jigger in Carousel, I had my first book published, I got to speak at the Garden Writers Symposium and at the highly acclaimed Northwest Flower and Garden Show, AND I got invited to P.Allen Smith‘s Garden2Blog Event this past May 1 and 2! It has taken me at least 2 weeks to process all the events of this last week at Garden2Blog so walk with me for a few minutes in my garden of memories and glimpse a few of the highlights of this unique event. I spied a quiet garden spot as I rounded the corner of Marlsgate, home of David Garner and family. Water features and statues at Marlsgate transported me from Little Rock, Arkansas to a European formal garden. Pathway to a secret garden – is this calling your name? Fun new and old friends – Helen Yoest, Bren Haas, Monica Milla, SHIRLEY! Bovshow (my new cohort in container design – even if we have to steal a few cuttings from P. Allen Smith’s garden), and my other new friend who’s name now escapes me (somebody help me out here). The pathways around the original garden home held delightful garden rooms, each with a charm and welcome all their own. At Allen’s Garden Home Retreat we got to meet the chickens up close and personal – in their formal room. So excited to finally learn about and experience planting The Earth Box. I’m excited about trying these out for the deckboxes I use in the neighborhoods where I work. Late afternoon around Allen’s new Laguna water feature, the light tickled the tassels of the grasses to make them dance in the sunshine. Even the bones of Allium are beautiful. Here’s where the plant nerd part really comes in: the last activity of the event was a scavanger hunt put on by Proven Winners Plants to find plants in Allen’s garden and answer questions about them. Anyone who knows me well knows that one of the things that I love the most in my job/life is a good plant mystery. All those hours of research over the years paid off – I WON AN ALL EXPENSES PAID TRIP THROUGH PROVEN WINNERS TO THE CALIFORNIA SPRING PACK TRIALS!!!!! And each night, before I went to bed in my luxurious hotel room at The Capital Hotel – dreamy toffee was left on my pillow!